In Port Eynon what is the network coverage like for mobile phones ? Only EE , Three mobile and Virgin mobile works in Port Eynon . But we would also like to inform you that all our cottages have free WiFi . Is it possible to hire a Travel Cot, Stair gate and a Highchair ? One set of Travel Cot, Stair gate and a high chair is kept under the stairs in each cottages at no extra cost . Are pets allowed in all the cottages ? In Carreglwyd Farmhouse, Fennel Cottage, Clover Cottage and The Rickyard B&B pets are not allowed . In all other cottages well behaved pets are welcomed by arrangement . We do ask for a security bond to be paid prior to arrival . The security bond can be refunded on your departure as long as the cottage is kept clean and tidy without any breakages or damages . Is it possible to have an online grocery delivered to the cottages ? Yes, all the supermarkets like Tesco, ASDA, Sainsburry's, Morrisons etc; have delivered groceries in our cottages . Please make sure you book a time slot for when you will have arrived as we cannot guarantee to take delivery on your behalf in case we are out . Are there BBQ's for the guests to use ? We do provide a portable BBQ per cottage and we ask £20 as a security bond . You will have to bring your own charcoal . Whats is included in the price ? All our rates are fully inclusive of Heating,Electricity,WiFi, Beds made up on arrival, Towels (not beach towels) , Kitchen towels, dishwasher tablets, Washing up liquid, hand wash soap . You will have to bring your own toiletries, food & drink and any necessary essential you might need . Over the phone by giving us your credit or debit card details . You can also make payment via online bank transfers or by forwarding a cheque via post . Please contact us for further details . How many cars are we allowed to park ? 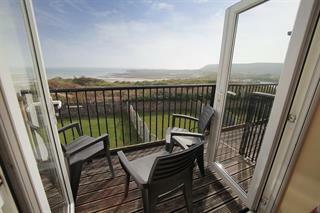 All the seafront cottages which sleeps 8 adults have parking for 2 cars per cottage . Carreglwyd Farmhouse has space for 4 cars, Apricot Cottage & Bramley Cottage have parking for 1 car per cottage . For Clementine Cottage & Cherry Tree Cottage has 2 car park space per cottage is allocated . If you wish to bring extra car please contact us. What time check in / check out ? Check-in is at 4:00pm and check-out is at 10:00am. On occasion we may be able to extend these times but this will have to be by prior arrangement only .